I was up at 8am and George had already tested the new concrete base and bowl to the suikinkitsu; a lovely tinkling sound. The rest of the day was spent backfilling trenches, plumbing in the water-feed to the stand-pipe, fitting the brass tap and divining the position of the steps and pebble areas. Lots of back-breaking work! Whale-bones and shell. The young hump-back was washed up on the beach about a year ago. This project is the first I have divined the positions of elements such as stand-pipe, steps and walls. I'm amazed how well it works. George spent a lot of time this morning trying to find the roof-water supply pipe to the main house to no avail; the divining rods didn't help either. But, when I changed the question to "where is the tap to be positioned" the rods swung into action and located a much better position 30 feet away! This afternoon I realised there were actually two lines across site. 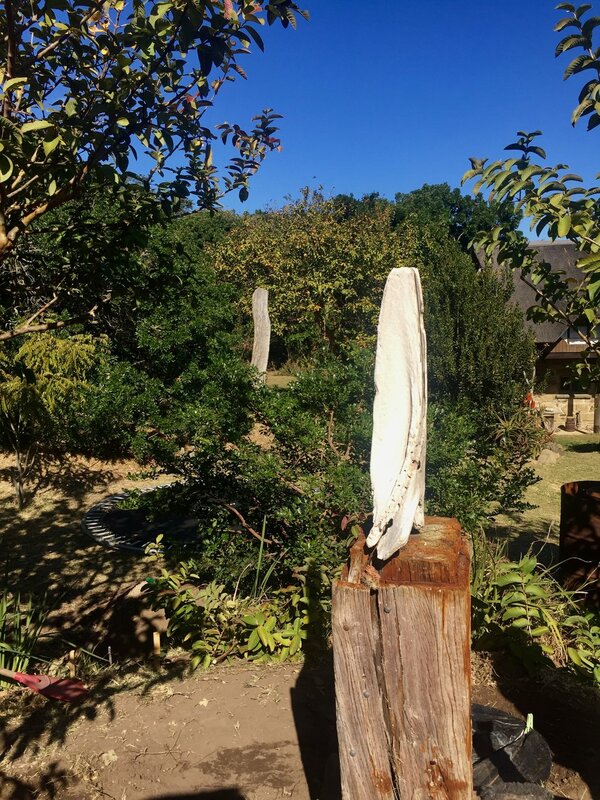 The 'Bird' line that follows an old river bed and track, that the birds follow and a North-South line that visually lines up some existing elements in the garden, such as the whale-bone sculpture, an old tree trunk and a square brick plinth right at the end of the vista. This is exciting as it beds everything into its wider setting. This afternoon I realised there were actually bone in the foreground and tree stump. At 3.30pm we turned on the tap to the stand-pipe and trickle of water filled the stone basins and ran out into the ground it was lovely to see the sky reflected and the ripples fan out across the water surface our first visitor was a thirsty chicken. About 5pm we took the car down to the beach and collected cobbles for the edging to the gravel area, the black pebbles for the Yin pool and some stepping stones. We also found a black-stone that we think could form the backdrop to the Yin pool. Lots of discussion about how we were going to waterproof various junctions and keep the weeds under control. Then back home for supper!